PTFE Mesh Belts is suited for conveying products within highly efficient air distribution systems allowing optimised moisture removal to take place and is commonly used within ultra violet and infra red dryer units. The open area allows maximun air flow optimising drying times whilst its extreme properties make it a natural choice for dryer manufactures. 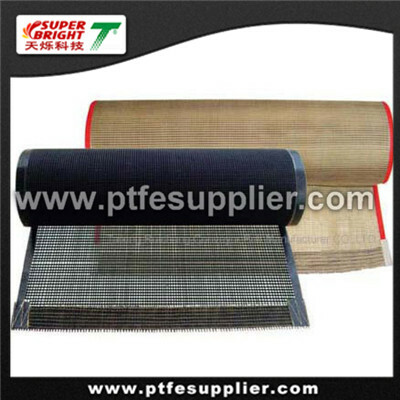 Applications:PTFE mesh belts are used in applications such as the drying of printed products for example:point of display stands,T-shirts,glass and mass produced paper prints. Print dryers usually opt for Ultra violet,infra red or hot air as the heat source to dry. Other applications range from the drying of cereals,non woven’s charcoal interlings,carpet & carpet tiles,printed circuit boards and shrink-wrap tunnels but to name a few. 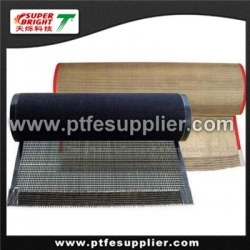 PTFE open mesh conveyor belt is light weight and cost effective therefore is easy to handle and less expensive than wire alternatives that can be difficult to replace. Often supplied with a metallic clipper type fastener these style of belts can easily be removed and replaced therefore minimising downtime and saving money. This material can be offered in carbon loaded black therefore providing antistatic properties.